Bettas are bubble-nest breeders and are frequently bred in aquarium. If you wish to try breeding Betta you will have to start by obtaining a pair. The best method is usually to get at least two female Betta and two males. It is important that you select healthy looking fish with good external features. By preparing at least four Bettas and getting them into breeding condition you will have replacements if a couple turns out to be incompatible, or if any Betta turn our to be unhealthy or incapable of breeding. To get your Bettas into breeding condition should keep them in a suitable environment and follow all the general guidelines for keeping Bettas, such as ideal water temperatures, suitable pH levels etcetera. Feed the potential parents live or frozen meaty foods twice a day or more. Start off by keeping all four individual Bettas isolated, but still able of noticing each other during 3-4 days. You can also use another method where you isolate the fish completely from other Bettas during four days. Somehow isolation seems to trigger spawning in Bettas, but we still do not know why. A 2.5-10 gallon aquarium is large enough to function as a breeding aquarium for Bettas, as long as the water can be 5 inches deep. Decorate the aquarium with floating aquatic plants, and also insert a few clay pots as hiding places. The water temperature should be kept constant between 80 and 82 degrees F. A cover is usually necessary to keep the water and air at a constant temperature, and if the room is subjected to draft a cover is absolutely necessary since any draft can cause water movements that will disturb the Gourami bubble-nest. 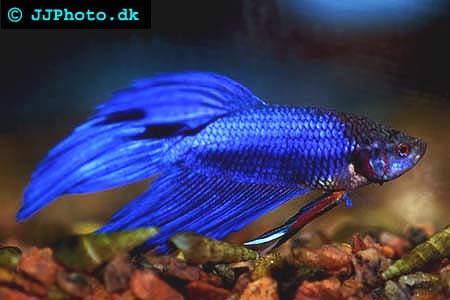 Most Betta breeders choose to add the male Betta to the breeding aquarium a few hours before the female Betta is introduced. This way, the male will get some time to explore the breeding aquarium and establish his territory. When you have placed the female Betta in the breeding aquarium you will usually have to wait no more than a few hours before you can watch the male Betta build a beautiful bubble-nest. 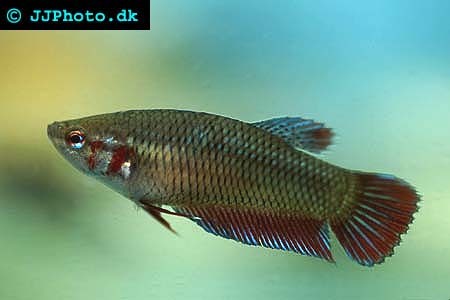 The female Betta will display dark vertical bars on her body, and this is a sign that shows that she is ready to spawn. Even if the Betta pair is highly compatible and ready to spawn, they will fight each other in the breeding aquarium. The two will even try to tear up each others fins, and this might look scary but actually makes sense from an evolutionary perspective. By fighting each other, both sexes prove that they are strong individuals that will pass on good DNA to the new generation. A Betta does not want to waste time and energy by breeding with an unhealthy fish with genetic defects. If your Betta pair still haven’t spawn within tree days after the female Betta was placed in the breeding aquarium, the pair is not compatible and will not breed. Take away the female Betta and insert your other female Betta to the breeding aquarium. If the male Betta never got started on his bubble-nest building, it is probably something wrong with him and you should remove him from the breeding aquarium instead and insert the other male. You can also remove both fishes and give the other pair a try. Hopefully, one of the possible combinations will prove successful, and eggs will be deposited, fertilized and placed in the bubble-nest. As soon as this has happened, you should remove the female Betta from the breeding aquarium. She will most likely be suffering from wounds from the courting period, and should therefore be placed in a medicated container. The male should be left to care for the offspring, and not be removed until the fry is free swimming. It is a good idea to place him in a medicated container as well. Newly hatched Betta fry will get enough nutrition from their yolk sacs and should not be fed during the first day. When the yolk sacs have been consumed, instinct will draw the fry towards moving objects in the aquarium. In the wild, Betta fry eat micro organism and your Betta fry should therefore ideally be fed vinegar eels or similar. Vinegar eels are microscopic nematodes and small enough for young Betta fry to consume. When the Betta fry are a few days old, you can start feeding them newly hatched brine shrimp. Small daphnia, grindle worms and other types of micro-worms are also suitable.